There’s an instinct programmers feel often, when a big coding project has become a massive, tangled mess of workarounds, Band-Aids, and cruft. At some point, when it’s time for, say, version 3.0, you feel this strong urge to throw away everything and start from scratch. Toss out the legacy code, start fresh, leveraging all the experience you gained from the mistakes you made along the way, ideally ending up a with a seamless, cruft-free new take on your old codebase. As it turns out, this is generally a terrible idea, because you throw away all the old, road-tested, necessary special cases and long-forgotten underlying requirements. It feels so appealing to throw out the old, convoluted code, but it comes with serious, often unanticipated pain. But sometimes, throwing everything out and starting over is the only option. When Twitter on Thursday set forth its new, much stricter rules regarding how third-party developers can make and maintain Twitter apps, the company made clear that its priorities and its perspective on its core user base have changed significantly from years back. And that may leave an opening for upstarts like App.net to start from scratch by necessity—not just in terms of fresh new codebases, but fresh new perspectives on how new social networks should operate. The aforelinked story explains Twitter’s new rules in detail that we needn’t retread here. But the implications of those new rules are worth considering. Though the company hasn’t said so explicitly, its new policies do make it seem likely that Twitter clients with many users (Tweetbot, Twitterrific, Echofon, UberSocial, and others like them) will be required to inject Twitter-provided ads. Apps may be required to strip or revamp features like inline tweet translations, saving to Instapaper, or viewing tweets in third-party services like Favstar. And third-party apps will all be subject to caps, enforced by Twitter, on how many users those apps can support. The changes also seem to imply that apps that display tweets in clever ways, like Flipboard, may no longer be permitted to do so. In short, life for third-party Twitter app developers just got harder, and Twitter is clamping down on some of the key differentiations those apps currently offer today. And if life for the developer behind your favorite third-party Twitter app gets harder, that may mean that the developer in question eventually stops supporting or updating the app. 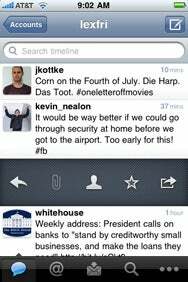 Twitter bought the third-party app Tweetie, and it become the native Twitter app for iOS. Though Twitter’s increasing crackdown on third party apps isn’t surprising, it’s certainly disappointing. Twitter’s modern success, of course, was driven largely by the third-party app ecosystem that built up around the service in its early days. The company bought Tweetie in 2010, turning that app into its official iPhone app. And the third-party app Twitterrific was the first app to use the word “tweet” to describe a post, the first to use a bird icon to represent the service, the first native Mac client, the first app to use a character countdown while you composed your tweet, the first to support replies and conversations, and the first native client on the iPhone. Twitter won’t say publicly what percentage of its users are relying on third-party apps today. One study concluded that just a quarter of all tweets are posted using third-party apps, but it didn’t look at the relative Twitter influence of the folks posting those tweets. Put another way: It’s quite possible that Twitter’s most popular users, the ones with the largest followings and reach, rely on third-party clients more than newcomers who tweet often but without reaching anyone. As you embrace Twitter more and use the service more regularly, you may become increasingly aware of and interested in third-party apps. At least, that’s how it’s been for years. While third-party apps drove a tremendous amount of Twitter’s early adoption and growth, it’s clear that Twitter now regrets the current state of affairs, and would prefer to own the tweeting experience outright. That’s understandable from a business perspective, but painful for developers and users who bought in to a different Twitter years ago. As someone who tests a lot of apps, I’m especially bummed, because—as John Gruber wrote—Twitter apps are a design playground. I’ve awarded Macworld’s highest, five-mouse rating to at least two Twitter apps, and I can’t think of a single other app category that’s generated such a slew of greatness. In other words, App.net is aiming to recreate Twitter, but with a different business model. Twitter famously launched without any monetization strategy in place, freely giving away access to its API, apps to its users, and its service; only after several years did it launch concepts like Promoted Tweets and Promoted Accounts to make money. To achieve its goals, App.net—at least for now—operates exclusively as a for-pay service. A $50 payment grants you a year of access to the service; $100 gets you that along with access to the App.net API. The project raised more than half a million dollars to fund initially, and continues to accept signups now. It’s slowly rolling out access to an alpha site for using the service. Already oodles of developers are offering or working on third-party Web, mobile, and desktop App.net apps. Charging for access, of course, is anathema to the world’s most popular social networks. You never paid a dime to access Facebook or Twitter. (Nor did you ever pay to access MySpace or Friendster, and look what happened to those guys.) But by launching with an upfront, annual fee, App.net can scale out its costs in tandem with its user growth. The more users it needs to support, the more money App.net must spend on server infrastructure; by charging for each new user, the service can pay for itself and allow its creators to profit. The goal for App.net, of course, is that everyone quits Twitter and moves over to App.net instead. Right now, I’m still actively tweeting, as are the folks I follow. I’m less actively posting on App.net, but I’m still checking in with the service multiple times each day. As the service—and numerous third-party apps—progress from unpolished alphas to polished, user-friendly products, I’ll surely spend more time there. It’s unclear whether App.net intends to charge all of its users $50 per year forever. It does seem clear that in order to remain ad-free, the service will need to keep charging folks to access the service, and that’s obviously a hugely limiting factor. That may not be a bad thing. You can listen to the radio for free, but you have to pay for albums. That’s why you can listen to an album without commercial interruptions, but not your favorite local FM station. SiriusXM offers numerous ad-free satellite radio stations, and pulls it off by—you guessed it—charging an annual fee. And that’s why terrestrial radio has an order of magnitude more listeners than satellite radio does. And yet both coexist. Both forms of radios have many contented listeners. But I’m willing to wager that SiriusXM subscribers listen more, on average, and enjoy what they’re hearing more, too. So I don’t expect that the world’s most followed Twitter users—your Kardashians, Gagas, Pinks, and the like—will make the move from Twitter anytime soon, or ever. Nor, I suspect, will most of their fans. But App.net doesn’t need millions upon millions of users or celebrities to be successful; it just needs interesting people I care about following, and a healthy third-party ecosystem to support it. The dream scenario might involve apps that couple Twitter and App.net streams in a single place, so that folks transitioning from one service to the other needn’t check two places. As you might have guessed, however, Twitter’s new, stricter policies prohibit third-party developers from showing posts from another service alongside tweets in a timeline. Developers who aim to do so will have their Twitter access revoked. What’s clear, though, is that folks for whom Twitter’s increasing third-party crackdown proves irksome will either grin and bear it or abandon the service. Twitter’s determined that it’s comfortable with either outcome, assuming—possibly quite rightly—that the bulk of its users won’t care about the new rules. Facebook users complain about each new redesign of that social network, and its increasing injection of sponsored stories into your newsfeed, but most of them keep on using the service anyway. For years now, Twitter’s been the cool place to be. Right now, App.net’s a nerdy place to be. Twitter, like Rome, wasn’t built in a day. And App.net’s potential success needn’t come directly at Twitter’s expense. The one thing we know for certain is that whatever happens next in this space will be interesting to watch. And post about.